This photo was taken on January 26, 2019 at 8:45 AM. The location was in the large drive entrance to a luxury hotel located on the waters edge of the Potomac River in Washington DC. The "Take It!" came as I was returning to my car and engaging in what I am tempted to call "My visual street sweeping" - lol. 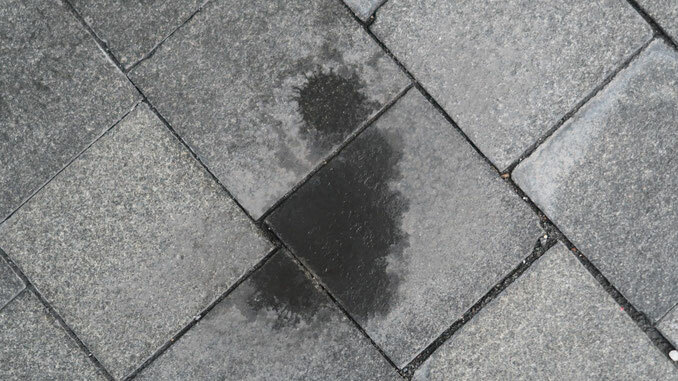 This image of a kneeling Buddhist Monk came to me - courtesy of the near straight edge on the upper front that was formed by the edge of the paving block on the right side. This straight edge served to connect the shoulder and the arm as it met the knee of the kneeling Monk. There were no water spots under the figure - thus the chance to have him either in a kneeling or cross leg position. I gave a general description of the shot before showing it to a number of people. By my doing so - it found the viewers when exposed to the photo - easily able to identify with the imagined image. I cannot help but wonder what this photo will look like in a large printed form. Along with this is the quandary of how it would be received by those of the faith upon seeing it. Ah - lots of wonders here - lol. Sending you a pass along of whatever message (if any) may have been intended by my meeting with this image. This one lead to a good lesson. My daughter asked what a Buddhist is, and what a monk is. Two birds one stone teaching moment lol. This Buddhist Monk has spiked hair lol! Looks exactly like the little statue they have in my favorite Chinese food take out restaurant. You have such a wonderful imagination, truly. Hey I see this one!!!!! We discussed this one at our lunch last week and as always, we were fascinated by your ability to capture these seemingly normal and everyday things, but give them a fun and unique imaginative spin. It really does completely change the picture.